Saka, the thrift collector don port. Back in 2003, at an NYSC orientation camp somewhere in the Niger Delta, Corps members who arrived from Lagos with their ‘cool’ Econet Wireless lines found out that their SIMS were useless. Econet network was barely available outside of Lagos and there was no chance of ‘porting.’ By and by, they reluctantly purchased new SIMS, a herculean and expensive feat back in those days. The ‘porting season’ has opened with a bang with MTN stealing the ‘marquee’ face of Etisalat, Saka, who has ported to the South African owned company, Kiripata! Hafiz ‘Saka’ Oyetoro, whose popularity has been rising since appearing in the UNFPA sponsored TV sit com, The Thrift Collector, surprisingly appeared in an MTN ad singing, I don Port Go and ‘Kiripata Kiripata’ (Centrespread is that phrase not trademarked?). The sheer genius of Saka in a comic role has propelled the ad, available on YouTube and TV stations, into immediate cult status, a la My Friend Udeme in recent times, and for all intents and purposes is proving to be a masterstroke. Of course, the popularity of the ad is also being driven by the connotative meaning inherent in ‘to port’ referring to Saka’s move from Etisalat to MTN. I Don Port internet memes are already up and running including ‘Harlem Shake’ styled flash mob dances and Twitter hash tags. Whether consumers will join Saka to Port to MTN is another business all together. ‘Mad Men’ across the nation and legal luminaries are pouring over the ads and contract agreements to see if laws and ethics were breached. The guys at Etisalat and Centrespread are acting cool but heads will roll as this is turning to be an advertising coup d’etat. A watershed moment in Nigerian advertising, the I don Port ad went viral just hours after release on YouTube, creating such a buzz and hoopla that MTN can as well stop the TV ads and not feel it. The internet video ad (read YouTube) has finally trumped traditional TV ads and since the big multinationals already favour satellite TV stations over local stations, many a Nigerian TV station will be in dire trouble over falling ad revenues. I have had my MTN mobile number since 2003 and though sorely tested have stuck with them because I couldn’t bear a number change. But the inauguration of the number portability scheme by the Nigerian Communications Commission (NCC), which allows for a subscriber to switch networks and retain their number, is tempting, sorely tempting. I hope the number portability system would spur the mobile networks operational in Nigeria to sit up. Yes, Nigeria is a difficult place to do business but these guys are getting away with a lot and the fear that customers can easily port may scare them to become more effective. MTN potentially has got a lot more to lose: having the largest subscriber base and its consequent network congestion, many MTN users feel pastures might be greener across the fence. Obviously they have figured this out too and thus have come out firing on all cylinders because the I don Port commercial is indicative of cutting edge competition, Kiripata Kiripata! 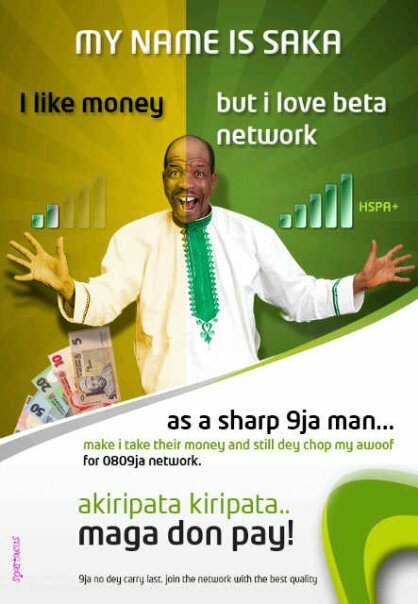 This entry was tagged ETISALAT, I don port, Kiripata, MTN, NCC, Saka. Bookmark the permalink. Yes the I Don Port ad is a classic. The competition is btw Etisalat and MTN. There will be legal issues if contratual agreements are breached. But the ad is well articulated and executed. A good piece Sirweb.